Privilege posturing is when someone with a relatively socially-privileged identity takes control of a conversation. It is purely structural and relational — content doesn’t matter as much. Reasons can vary, from naive enthusiasm (e.g., really wanting to show or prove to the other that you “get it”) or combative defensiveness (often when conversation turns toward identifying the power dynamic or privilege inherent in the conversation). As such, it exists as a type of micro-aggression helping to silence and marginalize voices that do not represent the status quo. Representation can be based on identity (e.g., a white male voice) or on structure (e.g,. using master’s tools) or content. 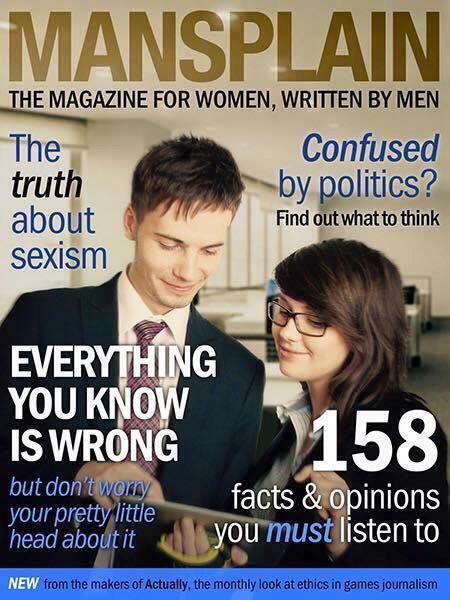 still confused about mansplaining? this should break it down for you. ironically enough, it describes most things targeted “for women” in patriarchal societies, which is a reason why feminists and other liberation movements have worked hard at creating their own (e.g., black, women, queer, blue collar) spaces. More recently, I encountered the term “whitesplain,” describing the more subtle ways the aggressions of the current race war work. I think Xsplain is just too useful of a tool for us to stop at that. I think these words have utility as a shorthand to help us more easily identify, call out and hold to account privileged posturing wherever it exists. So let’s break it apart and start creating and using and popularizing more Xsplains! (preceded by) X: a (preferably) one-syllable description of the privileged social category of the person doing the ‘splaining relative to the person on the receiving end. Keeping X to one syllable (e.g,. man, white, wealth, faith, straight, gay) I think helps with speaking and using and popularizing these words as anti-oppression tools. #mansplain: when the splainer’ is a man, and the victim is almost any other gender identity (woman, queer, etc). #whitesplain: white people telling black people how racism works, or how they’re not racist, etc. #faithsplain: when people of popular, well-accepted faiths tell agnostics, atheists or minority believers how faith, spirituality and religion work. What sort of ‘splaining have you encountered or participated in? This entry was posted on Thursday, July 9th, 2015 at 16:23 and is filed under Sabotage, Tools, Unsolicited commentary. You can follow any responses to this entry through the RSS 2.0 feed. You can leave a response, or trackback from your own site.